Puncticulata bodanica (Eulenst. ex Grunow) Håk. Valves are disc-shaped with a concentrically undulate valve face, with the center valve either weakly convex or concave. The ornamentation of the valve face is divided into two distinct parts, the alveolate striae at the margin and a punctate central area. The punctate central covers 2/3 of the valve face (in relation to the diameter) The areolae of the valve center are arranged in a three patterns; 1) at the center of the valve a rosette surrounded by an annulus, 2) rows of areolae radiate from the annulus, or 3) random scattering of areolae. 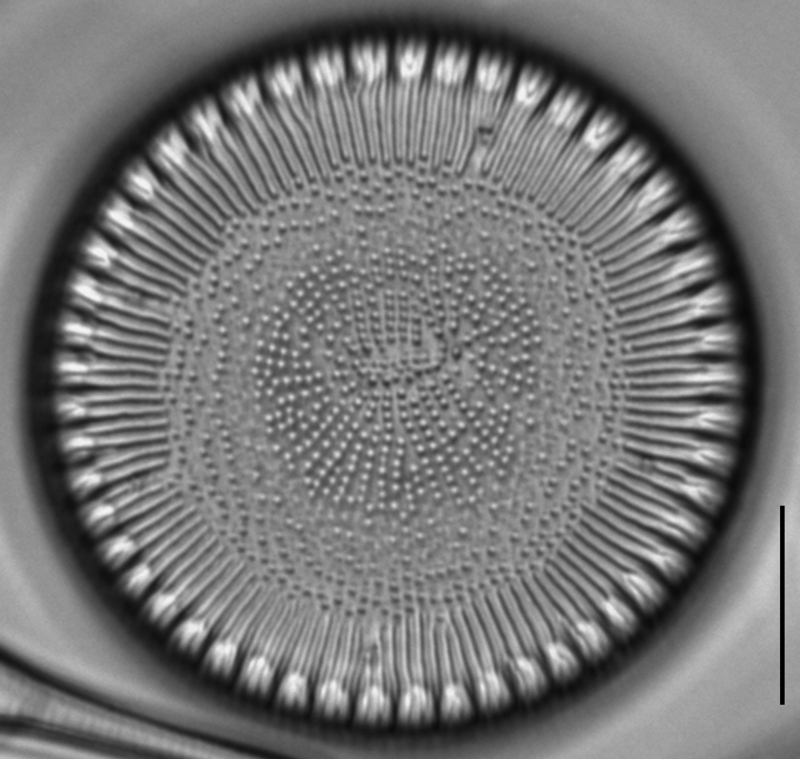 The alveolate striae are often bifurcate at the valve margin with occasional branching of the costae. 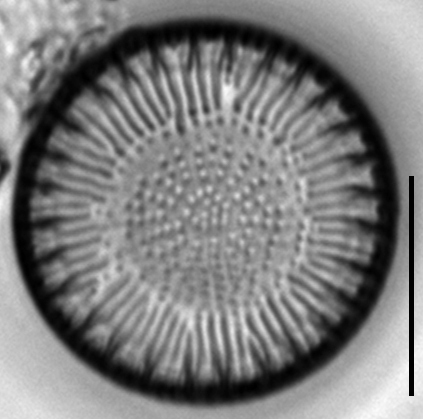 The alveolate striae often are grouped in pairs, sometimes as 3, and separated by a thickened rib at the margin. 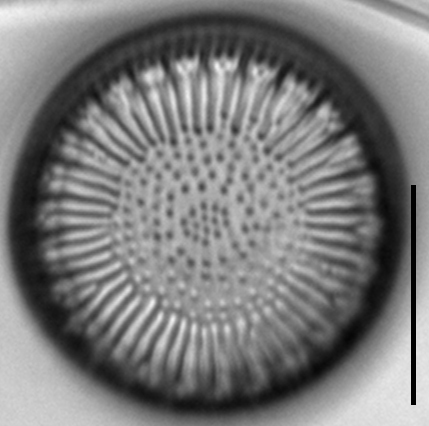 The alveolate striae generally terminate evenly to form a distinct boundary to the central ornamentation. 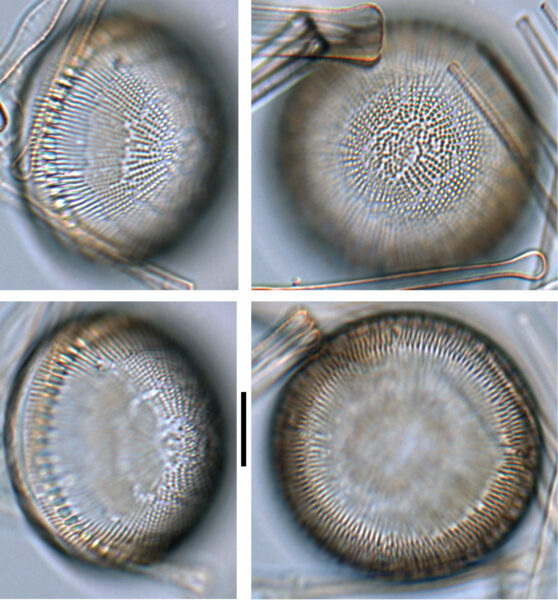 Some striae, however, terminate at rimoportulae (2-5 per valve) within the striated portion of the valve face. The number of rimoportuale is size dependent, with larger valves bearing more rimoportulae than smaller valves. 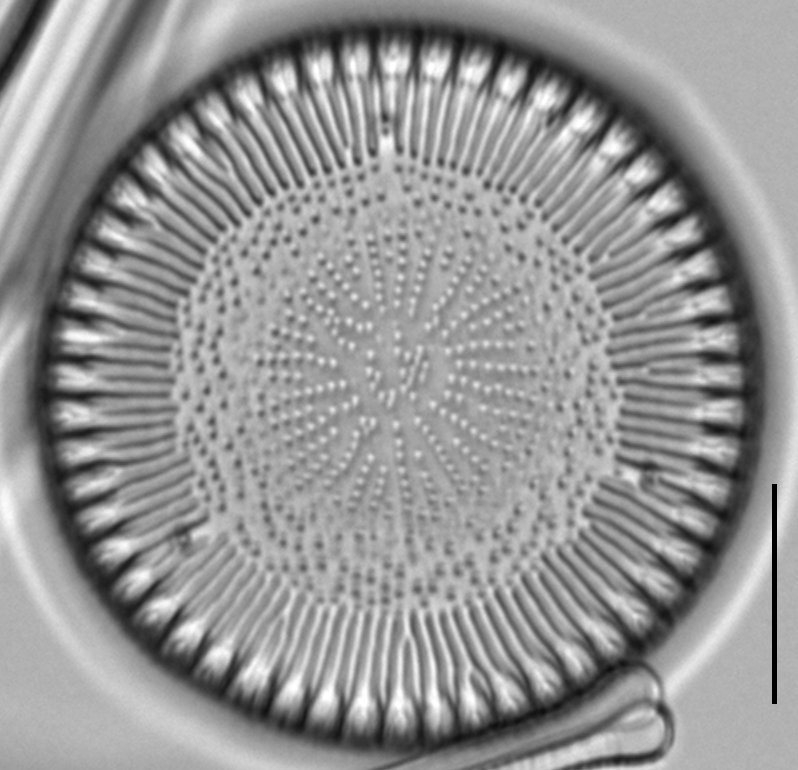 This species is associated with a group of closely related taxa within the L. bodanica-complex, and the identity of members of this group has been the focus of several studies (Håkansson 1988, Houk et al. 2010, Nakov et al. 2015). 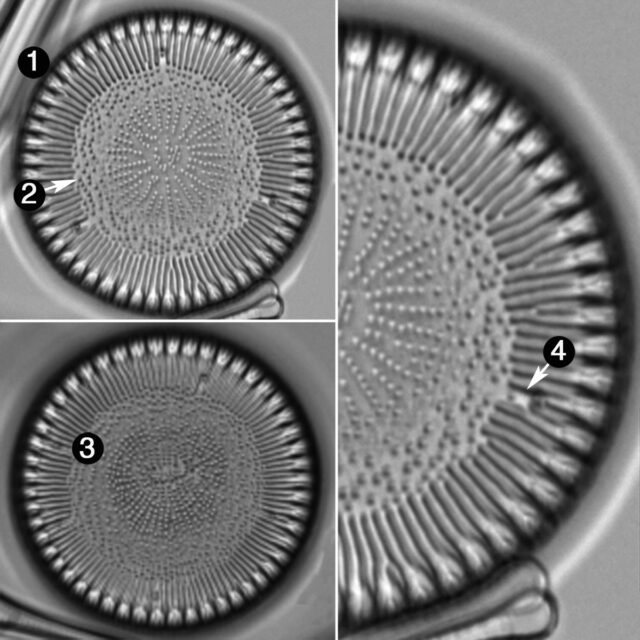 While there are many reports using the name L. bodanica (or Cyclotella bodanica) as an environmental indicator, few provide verifiable light micrographs or those that do confuse L. bodanica with other species in the complex (Foged 1981, Saros and Anderson 2014). 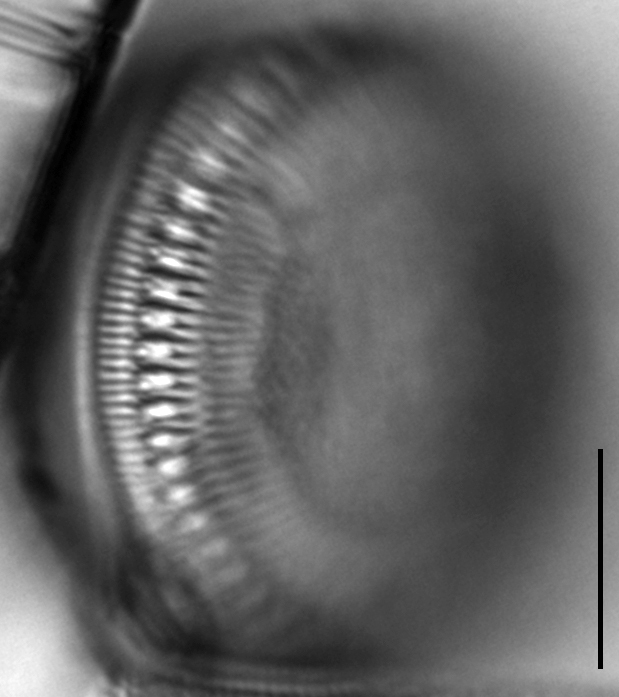 Lindavia bodanica is a planktonic diatom found in low conductivity lakes. 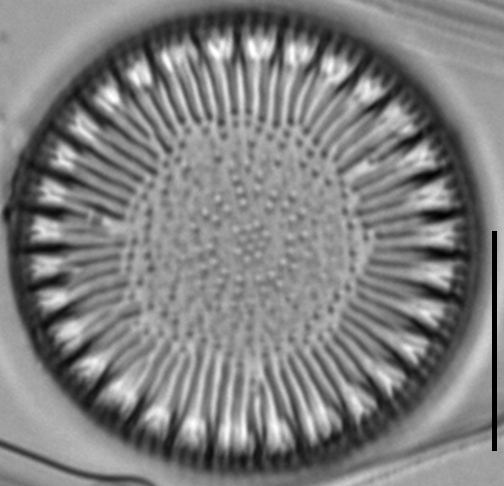 For example, L. bodanica is common from larger, low conductivity (<60 µS), oligo-mesotrophic (chl a <2.5 ppb), circumneutral lakes of Canada (Kling and Håkansson 1988). In the Laurentian Great Lakes it is found most abundant in Lake Superior (Reavie and Kireta 2015). Credit: Specimens found by: Allison, Bianca, Christian, Dylan, Emily, Emily S., Ethan, Hailey, Henry, Katrina, Kylie, Lucas, Mady, Nicholas, Nora, Orion, and Thomas, all young citizen scientists at the Science Museum of Minnesota Members Behind the Scenes event on January 16, 2017.
Credit: Specimens found by: Max, a young citizen scientists at the Science Museum of Minnesota Members Behind the Scenes event on January 16, 2017. Grunow, A. 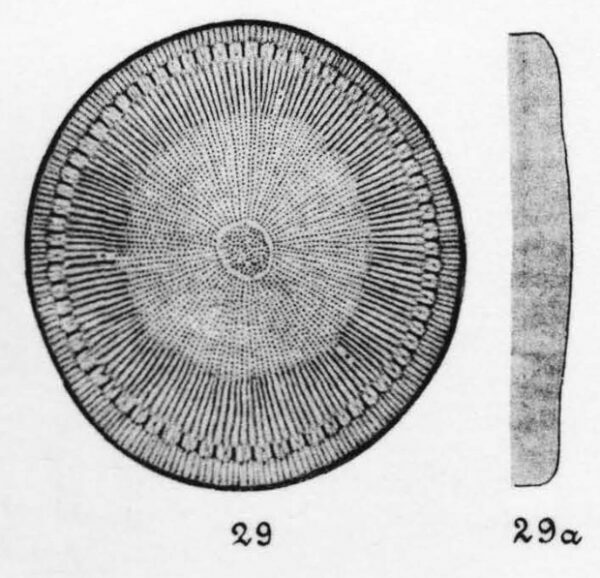 (1878) Algen und Diatomaceen aus dem Kaspischen Meere In: O. Schneider (ed. ), Naturwissenschafte Beiträge zur Kenntniss der Kaukasusländer, auf Grund seiner Sammelbeute. Dresden, pp. 98-132, pls. 3-4. Reavie, E.D. and Kireta, A.R. 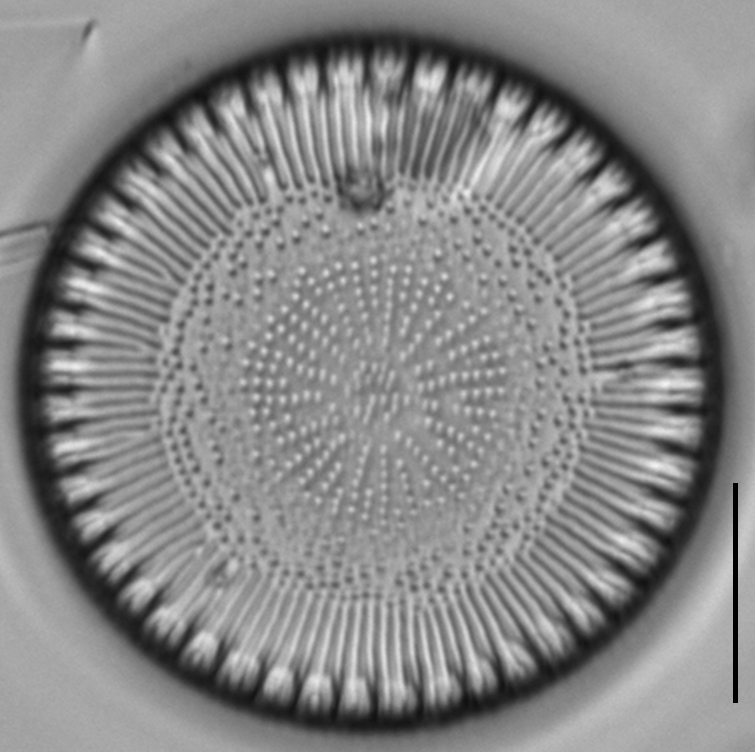 (2015) Centric, Araphid and Eunotioid Diatoms of the Coastal Laurentian Great Lakes Bibliotheca Diatomologica 62:1-184. Valves are weakly concentrically undulate. The central ornamentation is composed of areolae covering 2/3 of the valve face radius. Central areolae may be arranged in central rosette surrounded by an annulus, radial rows, or a randomly arrangement. Two to five rimoportulae are present at the end of a shortened stria.